Nitric oxide (N-O) is one of the body’s most essential molecules. But because it has such a short life span, it can be difficult to keep nitric oxide at optimum levels in the body—especially for people over the age of 40. Our patented formula represents a breakthrough in N-O delivery compared to standard L-Arginine supplements or dietary choices. It helps boost the efficiency of the body’s nitrate pathway so that more nitric oxide is available when and where it’s needed. Each lozenge contains 420mg of our patented nitric oxide blend, with added vitamin C and B12. 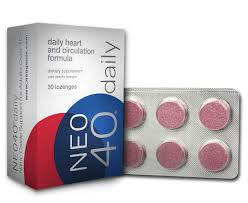 Neo40 daily has been the subject of clinical research that supports its effectiveness to increase N-O and support healthy circulation. Neo40 daily is based on the work of renowned nitric oxide researcher Dr. Nathan Bryan from the University of Texas. His ongoing research on the effects of nitric oxide on circulation and health inspired the formulation of Neo40 daily, created especially for health conscious people who prefer a high quality product backed by science and clinical trials. Neo40 daily is the only nitric oxide supplement that works begins to work almost immediately. As the lozenge dissolves on your tongue, nitric oxide is produced almost instantly. Neo40 daily has been the subject of clinical research and studies. Our team of scientists and researchers continue conduct ongoing research to evaluate its numerous beneficial effects. Studies show that if you are over 40 or have compromised endothelial function, L-Arginine is unlikely to work for you. Neo40 Daily works through different pathways that research indicates increases N-O more efficiently than L-Arginine. Our proprietary blend gets its efficacy from safe, natural botanicals like beetroot powder and hawthorn berry extract. Also included are vitamins C and B12, which are designed to work synergistically with the botanicals to optimize effectiveness. Nitric oxide (N-O) is crucial for optimum health. It helps to relax the arteries and improve blood circulation, thus regulating healthy blood pressure and increasing nutrient and oxygen delivery to every system, organ, and tissue in the body. N-O helps to regulate blood flow to the cells and ensure nutrient absorption; it also provides immune support. Researchers continue to explore the health benefits of nitric oxide. While in the preliminary stages, researchers are currently investigating its potential role in bone health, cognitive function, pregnancy, and more. Human Growth Hormone (HGH) Feel 20 Years Younger NOW!